I mention this for two reasons. First of all, I wanted to attack the prevailing sentiment that Messiahs are a dime a dozen and that religions derived from them are plentiful- thus, Christianity is nothing special. The truth, however, is that 99% of all messianic movements were brutally crushed… even Jesus was crushed, and yet he, and only he, gave rise to an entirely new religion with billions of followers. Odd. It requires explanation. The second thing that I wanted to demonstrate was that there was at the time of Jesus an intense expectation for a Messiah. There had to be a reason for this. The reason I propose as the best explanation is that the first century Jews interpreted the Old Testament in such a way as to believe that the Messiah was to be expected ‘soon.’ Jews reject these interpretations today, but surely what matters is what they believed then? The counter to this is that ‘messiahs’ always spring up when a people is oppressed. Right. We’ll see about that! So, the chart below furthers both my objectives. 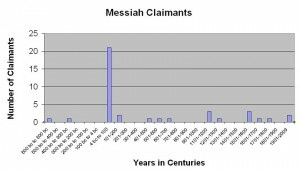 It shows that there was a massive spike in messiah claimants in the first century and not, as we are told we should expect, whenever people are oppressed. The chart is a nice visual aid to put the situation in perspective. The data I used to compile the chart is posted in the first few posts of the aforementioned discussion thread. The chart allows you to see at a glance the spike and then the paltry number of claimants overall. Click on it for a full size view. You may use this chart but please give a link back to me for credit. So, like I said- there was a spike in messiah claimants in the first century. Why? What made the Jews suddenly think one was coming? And if messiah claimants tend to accompany oppressed people- where are all of them? Surely there has been more oppressed populations than represented here… And why should all of these messiah claimants fade into obscurity (I bet even the better-than-average reader of this post will not be able to give the name of any other claimant) while another that died a merciless death managed to live on? Are there any other resurrected messiahs out there I don’t know about? Or is there only one: Jesus. Oh, and I think it should be based on facts and not mere conjecture. I’m just saying.